Have you noticed that Jesus never performed weddings? And yet, for us, weddings are one of the big ways we do our religious work. Not once does Jesus ever perform a wedding or officiate a funeral. And he didn’t officiate this wedding in Cana. 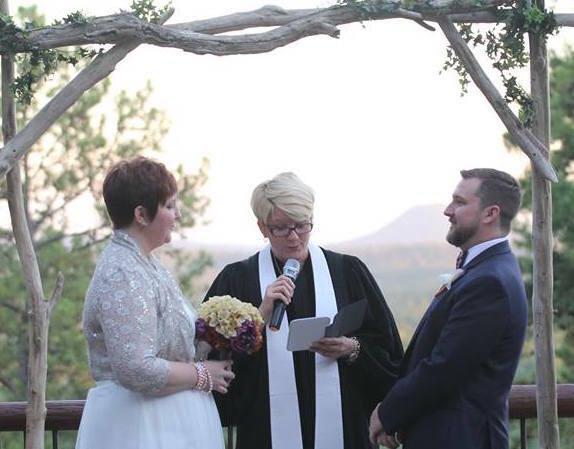 But nearly every week, a young minister asks a question on RevGalBlogPals about weddings—usually a protocol question, like what to wear, how to do the necessary parts, the correct robe. Stuff like that. Because you know, protocol is important in weddings. Would it have been as important in the first century? That’s what I wonder when I read this Sunday’s text… what am I missing because I don’t know the protocol? Over at WorkingPreacher, Robert Hoch indicates that the protocol piece we’re missing is that weddings guests were instructed to BYOB (Bring Your Own Bottle). Hoch indicates that the disciples failed to bring wine because they were poor, too poor to head to the local ABC (Alcoholic Beverage Control) store to bring their own. Because they didn’t bring enough wine for all the disciples, the wedding ran short. Running out of wine was a breach of protocol. And so the family would have had to deal with that breach. Would the consequence have been shame? Ridicule? Would it be an omen for the newly married couple? Would the family have been looked down upon because of their poverty? So often in ministry, I think our churches are like the wedding in Cana, and our congregants feel like we’ve run out of wine. They’re embarrassed that our budgets are smaller, they’re afraid of ridicule because seats are empty. They’re comparing our churches to the other weddings they’ve attended. And it feels like they don’t measure up. But you know, if Jesus shows up at the wedding, everything is going to be fine. I received an email this week that said, “You have enough time, energy and resources to do everything God wants you to do this year.”* And for me, when I read that, it was like Jesus showed up to remind me that I can leave the wine up to him. And so can the people in our churches. We have enough time, energy and resources to do everything God wants us to do this year. And all the wine we need to celebrate God’s presence among us. Where will you go with this Sunday’s passage? Jesus says, “My hour has not yet come,” and yet his mother is insistent. I wonder, how do you understand calling? And what role do others play in your understanding of calling? Can a community discern better than we can ourselves (or even in addition to our discernment)? Scholars have long measured John by the “signs” that Jesus performs. Why would Jesus choose this sign to be his first? What message is there in it? What is your relationship to alcohol, and how does that get worked out in your congregation and denomination? Is it taboo? Is it encouraged? You know, as in “Where there are four, there’s a fifth?” When have you talked about alcohol consumption and addiction from the pulpit? The mother of Jesus seems to push Jesus into performing this miracle. Or is that just the way it reads to me? What do you think? Is Mary edging her son forward, anticipating that which God has in front of Jesus? How do you believe she knew what Jesus could do? And does it seem rebellious when Jesus responds? Try as I might, I cannot rid myself of my presuppositions of this relationship with Mary… Can you? Blessings as you prepare this week. 1. Because we’re in the season of Epiphany, I think the gospel text for each week is meant as a partial answer this age-old question: Who is this Jesus? What is being revealed about him in this story? What is being manifested in him–in what he says and does– about the character of God and the nature of the realm of God that is breaking in? I’ve often found this a fruitful way to enter the Epiphany season texts, rather than going too quickly to what it says about us and what we ought to be doing. It’s Epiphany, and for me that means a little contemplation is called for before we get to the application, and way before we get to any kind of moralizing. 2. I had never heard that bit about BYOB, and it is really interesting and has intriguing possibilities. Thanks for mentioning it–can’t wait to see if some of the Gals pick up on it and give it a whirl in their sermonizing this week. Insofar as protocol and 1st century wedding customs are concerned, I also believe that the men and women would have been celebrating separately. I’ve been told that it was not customary to be in mixed company for these events. If that is true, Mary would have been among the women. What she would have noticed is that wine on the women’s side was running low. She couldn’t have known about the men’s wine levels. Her insistence that Jesus do something would have been an insistence that he provide specifically for the women. Hence his first sign would have been a sign to women, the experience of the ‘inebriating’ joy of the kingdom of God. Courage and grace to all as you prepare! By the way, the quote in the text is from Margaret Marcuson (http://margaretmarcuson.com/) I really don’t know her work, but I loved this quote. She’s a friend to some RevGals! Was it the quote about the New Year? Is the BYOB a real thing? My skepticism has to do with the “most people save the good wine for last”, which does not imply the guests were the ones bringing the wine. It implies that the host is in charge of that. I have seen the reference in two places on line …though both were referring back to Raymond Brown in the Anchor Bible. Thanks. I think I have that on my shelf. Generally, I trust Raymond Brown about John, but this one has me wondering. I know it is very late in the week, but I am struggling with the idea that when Jesus shows up, then everything will be fine. If you have been around much at all, we know that it doesn’t always turn out fine. Churches do get too old, too tired, and close. That is not the ‘fine’ that people are wanting. In this case, Jesus actually provides the turning out fine that his mother expected. Other commentators talk about how Jesus provides abundance–that is hard to hear when everyday brings a new funeral and fewer people to do the ‘work’ of the church. Thanks for letting me rant!